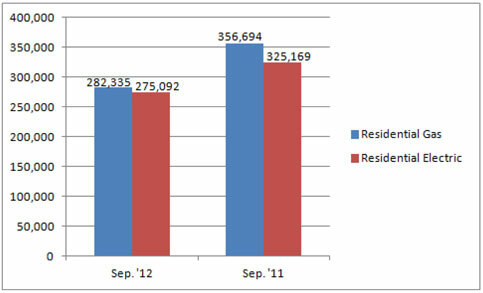 U.S. shipments of residential gas storage water heaters for September 2012 decreased 20.8 percent, to 282,335 units, down from 356,694 units shipped in September 2011. 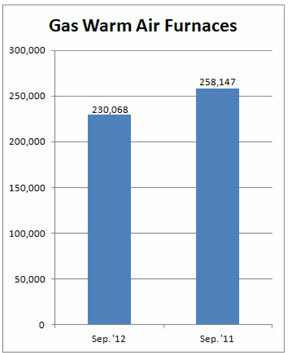 Residential electric storage water heater shipments decreased 15.4 percent in September 2012, to 275,092 units, down from 325,169 units shipped in September 2011. For the year-to-date, U.S. shipments of residential gas storage water heaters decreased 3.3 percent, to 2,860,973, compared to 2,959,257 units shipped during the same period in 2011. Residential electric storage water heater shipments decreased 1 percent year-to-date, to 2,758,520 units, compared to 2,787,224 units shipped during the same period in 2011. 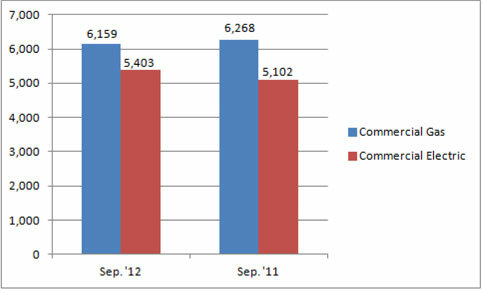 Commercial gas storage water heater shipments decreased 1.7 percent in September 2012, to 6,159 units, down from 6,268 units shipped in September 2011. Commercial electric storage water heater shipments increased 5.9 percent in September 2012, to 5,403 units, up from 5,102 units shipped in September 2011. Year-to-date U.S. shipments of commercial gas storage water heaters decreased 2.1 percent, to 59,761 units, compared with 61,073 units shipped during the same period in 2011. Year-to- date commercial electric storage water heater shipments increased 14.3 percent to 51,876 units, up from 45,398 units shipped during the same period in 2011. 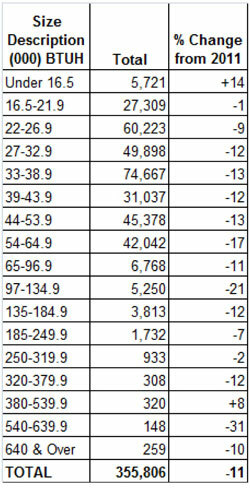 U.S. shipments of gas warm air furnaces for September 2012 decreased 10.9 percent, to 230,068 units, down from 258,147 units shipped in September 2011. 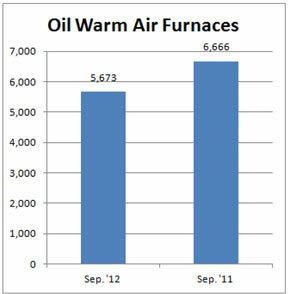 Oil warm air furnace shipments decreased 14.9 percent, to 5,673 units in September 2012, down from 6,666 units shipped in September 2011. Year-to-date U.S. shipments of gas warm air furnaces decreased .9 percent, to 1,557,805 units, compared with 1,571,757 units shipped during the same period in 2011. Year-to-date U.S. shipments of oil warm air furnaces decreased 27.4 percent to 23,240, compared with 32,018 units shipped during the same period in 2011. U.S. shipments of central air conditioners and air-source heat pumps totaled 355,806 units in September 2012, down 11.9 percent from 403,984 units shipped in September 2011. U.S. shipments of air conditioners decreased 11.9 percent, to 240,770 units, down from 273,406 units shipped in September 2011. U.S. shipments of air-source heat pumps decreased 11.9 percent, to 115,036 units, down from 130,578 units shipped in September 2011. Year-to-date combined shipments of central air conditioners and air-source heat pumps decreased 1 percent, to 4,724,328 units, down from 4,769,401 units shipped in September 2011. Year-to-date shipments of central air conditioners increased 1.7 percent, to 3,332,990 units, up from 3,276,419 units shipped during the same period in 2011. 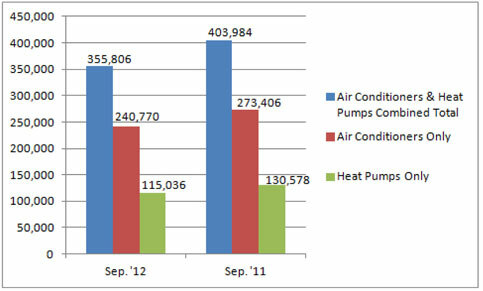 The year-to-date total for heat pump shipments decreased 6.8 percent, to 1,391,338 units, down from 1,492,982 units shipped during the same period in 2011.